Rug Doctor refurbished machines follow a 5-step quality testing protocol to ensure the machine is in proper working order and meeting our specifications for performance. All refurbished machines come with a 90 day warranty. Rug Doctor’s Pro-Deep Carpet Cleaner removes over 90% of ground-in dirt, grime and oils embedded in carpet. This carpet extractor’s professional grade motor, penetrating brushes and suction power deeply scrubs dirt, grime and other tough stains from high traffic carpeted areas while deodorizing and freshening home and office spaces. 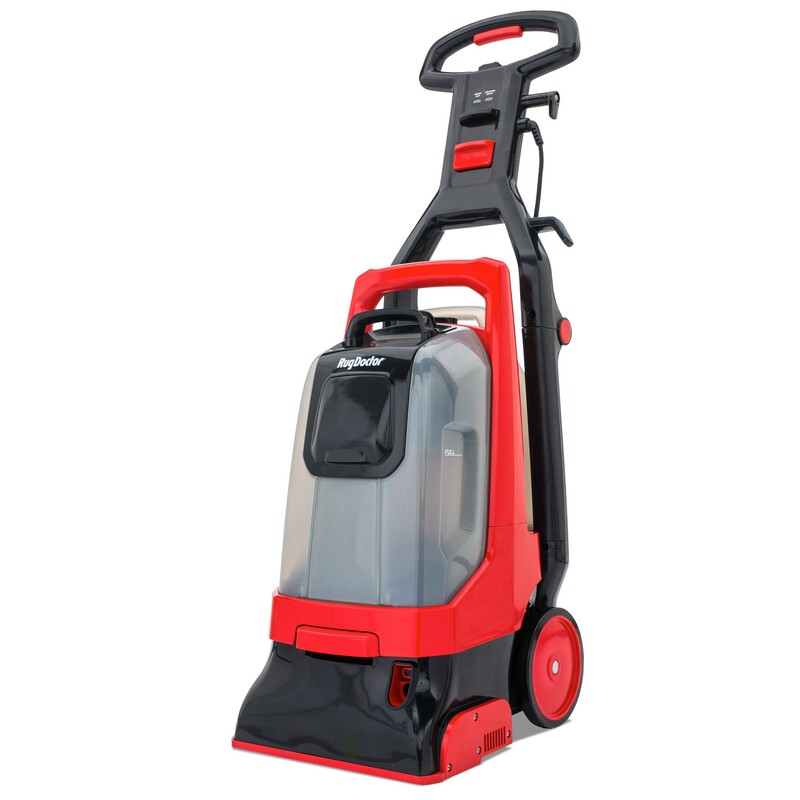 The Pro-Deep Carpet Cleaner is made from sturdy, high impact materials and features one click, easy-lift clean and dirty water tanks, making filling and emptying easier. The Pro-Deep Machine is user friendly, allowing a back-and-forth cleaning motion and featuring digital indicator lights that tell the user when solution is empty or there is a brush roll jam. The Rug Doctor Pro-Deep Carpet Cleaner is tough on dirt and stains – but gentle on carpet fibers, scrubbing deep to clean and polish, while extracting soil, spots and odors for immediate and satisfying results. Available attachments allow the Pro-Deep to also clean upholstery, hard floors and grout. Deep cleaner comes assembled and ready to use out of the box. Features digital indicator lights signal when the solution is empty in need of refilling and when obstructions block the rotating brushes. Lightweight carpet cleaning machine allows easy operation for all users and constructed with durable and high impact materials. Machine is 15% lighter than tradition rental carpet cleaners. Versatile for all surfaces with optional tools (sold separately) that connect to attached 12-foot hose; these include an upholstery/car detailer, hard surface tool, and a grout cleaner tool. According to the IBIS Worldwide Study 2017, one average professional carpet cleaning visit costs $254.00. Now users can own a personal pro-grade machine for approximately the same cost. Rug Doctor’s Pro-Deep Carpet Cleaner removes over 90% of ground-in dirt, grime, and oils embedded in the carpet. This carpet extractor’s professional grade motor, penetrating brushes and suction power deeply scrubs dirt, grime and other tough stains from high traffic carpeted areas while deodorizing and freshening home and office spaces. The Pro-Deep Machine is user-friendly, allowing a back-and-forth cleaning motion and featuring digital indicator lights that tell the user when the solution is empty or there is a brush roll jam. It has 20% more suction than ordinary rental machines, allows for a deeper clean and quicker drying times. The handle is adjustable to specialized height for enhanced functionality and collapsible for greater ease of transport and storage. It has an easy grab handle for lifting and storing, even in off the ground storage areas. The more intuitive wet and dry pass extracts significantly more water than our previous Rug Doctor models and thus speeds up drying time. The CRI (Carpet and Rug Institute) awarded the highest Platinum rating to the Pro-Deep Cleaner. The CRI is the industry standard bearer for measuring how much dirt is removed from the carpet by deep cleaning. Rug Doctor® carpet cleaning machines have been manufactured, tested, and inspected in accordance with Rug Doctor’s high standards of quality. The refurbished Rug Doctor carpet cleaning machines (“Refurbished Machine”) are backed by a ninety (90) day limited warranty (“Warranty”). Rug Doctor gives you, the original purchaser, who retains proof of purchase from Rug Doctor or an authorized Rug Doctor Dealer, this Warranty for your Refurbished Machine acquired for normal household use (commercial and rental use is excluded). You must notify Rug Doctor within thirty (30) days of original purchase if any parts or components are missing on your Refurbished Machine. WHAT DOES THIS WARRANTY COVER / HOW LONG DOES THE WARRANTY LAST? Rug Doctor will, for the original purchaser, repair or replace (with new or re-manufactured parts) including labor, any part that is defective in material or workmanship for your Refurbished Machine within the Warranty period. The following exclusions apply for Refurbished Machine(s), and part(s) failures due to: 1) normal wear and tear; 2) Refurbished Machine alterations; 3) commercial use; and 4) abuse or misuse of the Refurbished Machine. This Warranty does not provide for a refund of the purchase price. For best operating efficiency and cleaning, use Rug Doctor products. Use of the Refurbished Machine for rental voids the Warranty and is not permitted under Federal Law (see “UNAUTHORIZED USE” statement below). Rug Doctor is not liable for any consequential or incidental damages of any nature involving the purchase/use of your Refurbished Machine. Rug Doctor’s liability will never exceed the purchase price of the Refurbished Machine. Some states do not allow the exclusion or limitation of incidental or consequential damages, so the above limitations or exclusion may not apply to you. ALL OTHER WARRANTIES WHETHER ORAL OR WRITTEN ARE EXPRESSLY DISCLAIMED. THE IMPLIED WARRANTIES OF MERCHANTABILITY, AND FITNESS FOR A PARTICULAR PURPOSE, WHICH MAY ARISE BY OPERATION OF LAW, ARE LIMITED TO NINETY (90) DAYS FROM THE PROVEN DATE OF PURCHASE UNLESS APPLICABLE STATE LAW PROVIDES OTHERWISE. If a Refurbished Machine is returned to a Warranty center for repair within thirty (30) days of original purchase, Rug Doctor pays the freight charges both to the Warranty center and back to you. After that, you may be directed to take the Refurbished Machine to a local repair center or required to ship the Refurbished Machine to a Rug Doctor Warranty center should additional repairs be required during the Warranty period. During the Warranty period, but after the initial thirty (30) days, you will be responsible for paying any freight charges for shipment to the Warranty center for repairs. Rug Doctor will pay the freight charges to return your Refurbished Machine to you. HOW DO I GET SERVICE UNDER THIS WARRANTY? To obtain Warranty assistance, please call 1-800-RUG DOCTOR (1-800-784-3628) from 8 am to 5 pm Mon-Fri CST, or email consumer.support@rugdoctor.com. Rug Doctor will need the following information to assist you: your name, address and telephone number, product model and serial number, proof of purchase showing date and place of purchase. Please explain the nature of the problem. Rug Doctor will review all the facts involved and advise you as to recommended procedure. We recommend you keep the original carton and packing materials. Use of this Refurbished Machine with Rug Doctor Trademarks for rental purposes is UNAUTHORIZED and is in violation of U.S.C. Section 1114(I) and 15 U.S.C. Section 1125(a). RUG DOCTOR WILL PROSECUTE ANY OFFENSE TO THE FULLEST EXTENT OF THE LAW. Pure Power Pet Stain & Odor Biobased Carpet Cleaner 64 oz. Hard Floor Cleaner 32 oz. Pure Power Oxy Deep Clean Biobased Carpet Cleaner 64 oz. Tile & Grout Cleaner 32 oz.